Connectors, Measuring Wheels, Couplings, Adaptor Flanges, Mounting Brackets & Tether Kits. Female connectors, Flexible couplings, Flanges and Tether Kits. IH581, IH103, IH120 Hollow Shaft Encoder mounting hardware kit. 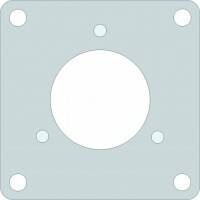 Square mounting flange for IS581 Series.